Houston’s award-winning 8-piece ensemble that have redefined the sound of Gulf Coast Soul. Established in 2011, The Suffers’ lineup was curated by bassist Adam Castaneda and vocalist/keyboardist Pat Kelly, who brought on trumpet player Jon Durbin, trombonist Michael Razo, guitarist Kevin Bernier, percussionist Jose “Chapy” Luna, and drummer/vocalist Nick Zamora filled out the rhythm section, while frontwoman Kam Franklin topped off the group with soaring vocals. The last 2 years have brought the band to new heights, as they played 300+ shows across North America, visited NPR in Washington, DC for a Tiny Desk Concert, made their national television debut on Late Show With David Letterman, and officially released their much anticipated self-titled album followed by performances on The Daily Show with Trevor Noah and Jimmy Kimmel Live.This year they will embark on their first international tour and spread the sweet sound of Gulf Coast Soul across the Caribbean, Western Europe, and Australia. 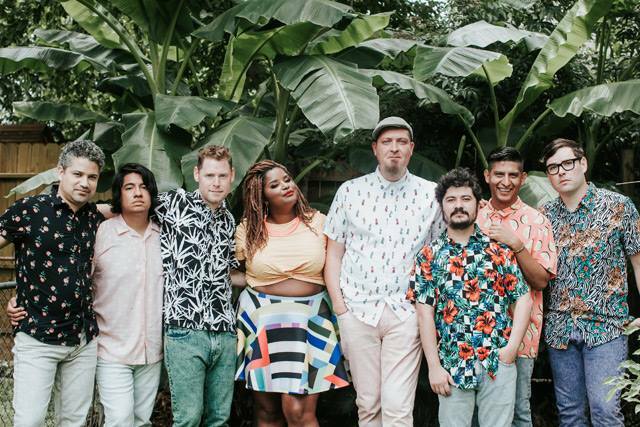 The Suffers have quickly progressed from packing Houston venues to accepting invitations nationally for featured performances at notable festivals and events, all while still remaining a local Houston favorite, accepting 23 Houston Press Music Awards in the last four years.